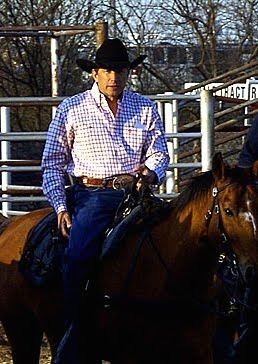 American musician and actor George Strait was born on 18 May 1952, in Poteet, Texas, and is best known as one of the most successful country singers of all time, for such albums as “Strait Out of the Box” and “Pure Country” among many others which have become number one hits. He has been named “Entertainer of the Year” several times, and won many other awards including the National Medal of Art, American Music Award and a Grammy Award. So just how rich is George Strait, as of mid-2017? It has been estimated by authoritative sources that Strait’s net worth is over $320 million, accumulated during his career in music which now spans more than 40 years. George grew up on the family’s cattle ranch near Big Wells, Texas, but when George was 10 his parents divorced, and George and his brother were raised by their father. George became interested in music when a teenager, and initially performed with a rock ‘n’ roll garage band, but then developed a love for country music. At 19 he enlisted in the US Army and served four years, then studied at Southwest Texas State University, where he became part of the group called “Stoney Ridge”, later renamed the “Ace in the Hole Band”, which became popular and was the basis of George’s net worth. Soon George was noticed by MCA Records and offered a contract, so Strait became a solo artist with his colleagues as the backup band for him. In 1981 George released his first song called “Unwound”, which proved popular, and this and other songs were included in George’s first album called “Strait Country”, the success of which added to Strait’s net worth, and his career was well set. George has since released albums regularly, including “Easy Come, Easy Go”, “Beyond the Blue Neon”, “One Step at a Time” and “Love is Everything” among many others. During his career as a singer, George has worked with Taylor Swift, Miranda Lambert, Sheryl Crow, Kenny Chesney, Luke Bryan and others. He has had 61 No. 1 songs on country charts, including a record of at least one every year for 30 years from 1981, confirming his continued popularity. Strait has racked up 70 million albums sold in the US alone, and his RIAA numbers include 13 multi-platinum, 33 platinum, and 38 gold albums. However, George is also an actor, and has appeared in films including “The Soldier”, “Grand Champion”, “Pure Country”, “King of the Hill” and “Pure Country 2: The Gift”, contributing further to his net worth. In his personal life, Strait married high school girlfriend Norma in 1971, and have a son and daughter, but the latter was killed in a road accident in 1986. Subsequently George and Norma set up the Jenifer Lynn Strait Foundation, donating to children’s charities in the San Antonio area, where they reside.